No. 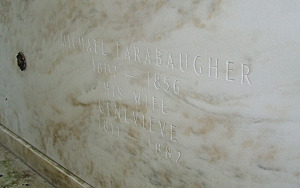 6: Who is buried in Michael Farabaugh’s tomb? If you start where this sign marked the old section of the Loretto Cemetery and walk up the hill, you will soon know that something is terribly wrong. Newer markers are next to the old; there are bald spots where graves used to be; the rows are uneven; and if you dig a bit in the grass you will find parts of old markers. There is a circa 1890 picture of the cemetery from the same vantage point, and the line of stones shown is very different. According to lifelong Loretto resident Leo Noll, the cemetery became so overgrown in the 1930s or 1940s that he and some other workers removed large sections of headstones to more easily cut down the growth. But when it came time to put them back, they discarded the unsalvageable stones and then had to guess the original locations for the rest. This must be why the old photos of the cemetery show a different alignment of stones. So now we have unmarked graves and pioneers buried under the wrong headstones. It would be possible to reconstruct the burials if records or a cemetery plot were maintained. No such luck. Prince Gallitzin certainly kept burial records from 1799 until his death in 1840. But there is no proof that such records were kept by his successors for the rest of the century. When Fr. Ferdinand Kittell published his Souvenir of Loretto Centenary in 1899, he included an alpha cemetery listing that he indicates (at page 165) was “chiefly” based on the headstones arranged there, and not parish records. Kittell’s project was worthwhile, but in the process he carted up the vital records the church did have (including the loose set of Prince Gallitzin’s burial records) and headed off to a monastery near Rome to compile an index, which then was transcribed for the Souvenir. All well and good, except he fumbled away all of those original records and his handwritten index. So he left us with a transcription of a transcription, and today we have no original records from the 1840-1899 era whatsoever. Lucky for us, Kittell inexplicably left behind Gallitzin’s two volumes of births, marriages and deaths, which we still have — but this is all pre-1840. If you are confused, take heart. There is a fantastic effort here to make sense of all of this by pulling together nine different sources, to the credit of Lisa Baker, Jane Tripp and Jim Crouse. This brings me to the mystery of the immigrant Michael Farabaugh (1808-1856). Michael had several occupations. In Germany, he was a Bierbauer (i.e. a beer brewer), so I like him already. He was also a Kufermeister (a cooper, who made staved wooden containers or barrels held together by slatted wooden hoops). He and his wife Eve brought their family to the U.S. in about 1841, and bought property at what is now Munster Township, in 1848. He was a farmer and probably stonemason too, although the 1850 Census lists his principal occupation as cooper. After this, all knowledge of him mysteriously disappears. No picture, no physical description, no stories, no death record, no newspaper article, no will – no nothing. 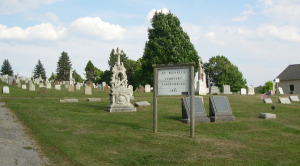 He dies in 1856 at the age of 48 or 49 for no known reason, and today has two tombs at the Loretto Cemetery, shown below. Where is he really buried? 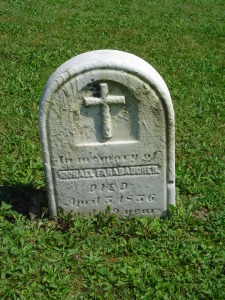 The deeply-chiseled 1856 headstone of “Michael Farabaugher” (first picture above), is still there at the Loretto cemetery, but his remains are probably not at that spot. He was the grandfather of Loretto’s famous son, Charlie Schwab. 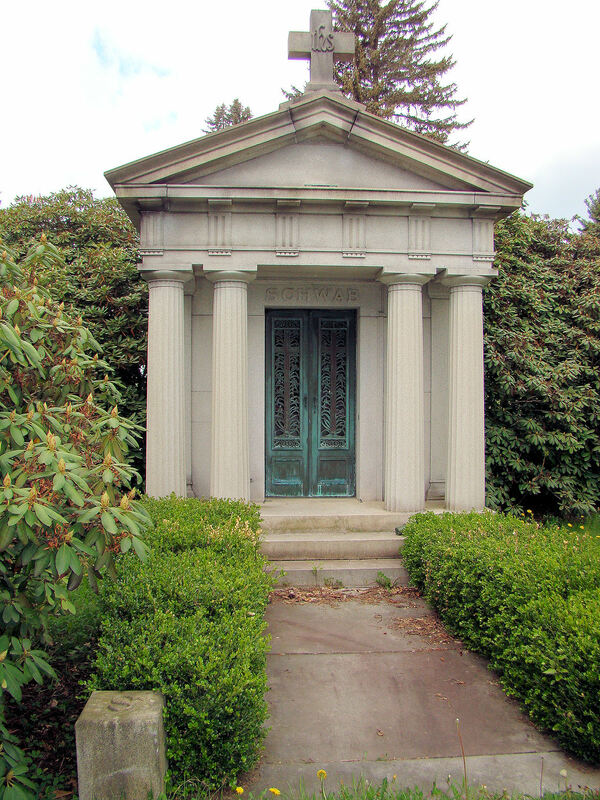 After the Schwab Mausoleum (second picture above) was built, Michael’s name was inscribed in marble on the inside facing of what appears to be a drawer crypt, with a keyed lock release mechanism (3rd picture above). I don’t know when the mausoleum was built, but we can infer that Michael was dug up and put into this crypt at some point in time — perhaps when Schwab arranged for Gallitzin’s remains to be transferred to his monument by the church in around 1899, or perhaps around the time Schwab himself died in 1939. If Michael’s remains were not dug up and transferred, there is a real good chance that he was part of the tombstone scramble described by Leo Noll. Either way, I think it is unlikely he still lies beneath the nice-looking stone erected in 1856. Here’s a scenario: If he was subjected to the tombstone scramble and then the remains beneath the headstone’s new location were dug up and transferred, there is a really good chance that somebody else’s bones are in that mausoleum. One thing is for certain: Michael is a man with two tombs today. Pretty creepy. Incidentally, the disheveled graveyard with its diseased elms, slippery slopes and lack of lighting was a favorite Halloween destination when I was a kid. The only thing it lacked was a good old creaky gate. The older boys always promised there would be an event there, so when we finished up getting candy in town we would take the side trip, wait and see, and consult a few of the inscriptions. R.I.P. Michael, wherever you are. This entry was posted in Uncategorized on October 18, 2014 by Tony Bentivegna. No. 7: Is there a local curse on the name Demetrius? I am a great admirer of Prince Demetrius A. Gallitzin (1770-1840). Here are his three most reliable images. The first two are the only depictions from his life, and the third from about 1873 is the most iconic. 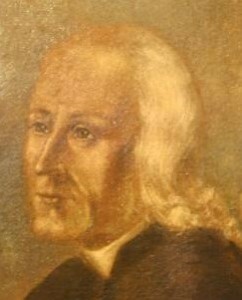 He was America’s first Catholic priest ordained with all orders. He heard the call of a dying Protestant woman at McGuire’s Settlement, which led to him coming to the mountains to establish Loretto, my hometown. The first Farabaughs were baptized by him. Working mostly alone and through force of will, he not only established a new church, but a community with various trades. He overcame poor health, poor finances, a difficult congregation and a 1807 Petition to have him removed (a salacious document that was never transcribed and disappeared in the 1940s). I’ve read six of his biographies, and there are still discoveries being made following his death in 1840. He may have turned down offers to become a bishop in St. Louis and New Orleans, and today there is an effort to have him canonized. He was brilliant, determined, highly educated, enigmatic, played the violin and was (to quote my mother) “independently holy.” He was the “Apostle of the Alleghenies,” “Prince Among Priests,” and “The Prince Who Gave His Gold Away.” Well, his gold was actually taken from him involuntarily, but that’s another story. 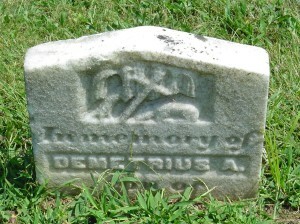 Demetrius Augustine not-so-Luckett (1824-1850) had a spectacular death. He was at the home of Mrs. Ignatius Adams in Summit (i.e. top of Cresson, known mostly today as a speed trap for the unwary motorist), where a German known only as Mr. Hoover was keeping 12 kegs of gun powder. Mr. Hoover supposedly lit a candle. When he blew it out a spark escaped and caused a massive explosion. (Mountain Sentinel, Ebensburg, 14 Feb 1850, “Awful Calamity”). These are just the early deaths that I happen to notice and had in my limited, but whiz bang, database. There may be others. Now, this is not to say that there haven’t been Demetriuses (?) who had long and prosperous lives. 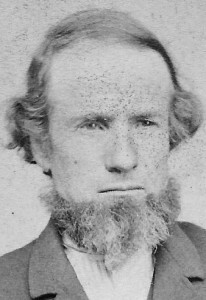 Demetrius Augustine Strittmatter (1833-1916) had nine children and lived to be 82. But if you eyeball this, we are way, way past normal infant mortality rates and close to, well, a curse. Or maybe it’s just that the fates don’t want to dilute the legacy of our beloved founder. I will say that when my wife and I debated names for our son 12 years ago, I quietly crossed Demetrius off the list. This entry was posted in Uncategorized on October 13, 2014 by Tony Bentivegna. No. 8: Our countdown continues. This one is not really spooky like the others, but intrigues me nonetheless. 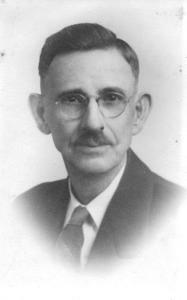 Gilbert Aloysius Farabaugh (1882-1958) was one of the 14 children born to Joseph and Annie (Conrad) Farabaugh. He went West. I often heard this from older Farabaugh relatives, who related it with a sense of wonder, as if he went to the moon. “It was because of his asthma,” they would add. Enter the much younger half-brother of Gilbert, Cecil Farabaugh (1909-1981), who approached me in the late 70s to offer an alternative explanation. Cecil made clear that he was unhappy and felt excluded from the older first family of 14. Indeed, I observed on at least one occasion at the yearly Duman’s Dam reunion, that Cecil was summarily ignored by virtually everyone. Cecil was the only living child of the second marriage, apparently was not raised with the others and did not live nearby. 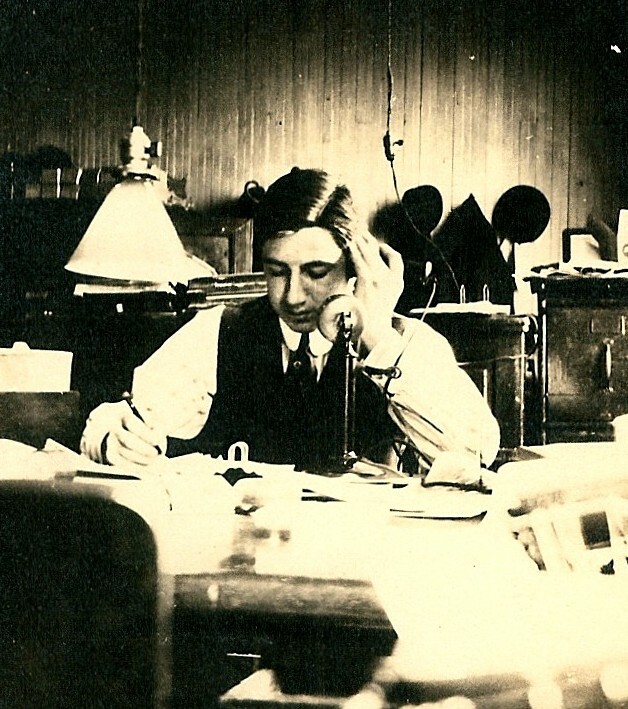 From this disgruntled perspective, Cecil explained to me (in a conversation I recorded on cassette) that in about 1907 a women in Johnstown by the name of Florence Wax [phonetic] had a baby by Gilbert. Gilbert went west to start a life away from the scandal. 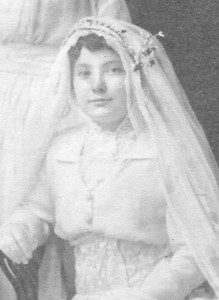 Florence then married someone else and on that wedding day visited the Joe Farabaugh residence at Carrolltown. “And Dad had us get acquainted with them,” said Cecil. So here we are a hundred years later. Can we find this love child lost to time and memory? The folks at ancestry.com have these whiz bang search engines, so I ran Florence through the 1910 Census for Johnstown, married, with children under 5. Possible matches are Florence Aultram (son Clair); Florence Fritz (dau. Margaret); Florence Humbert (Helen, Ray, Chas. ); Florence Schrader (1 dead and 1 not living in household – the most interesting lead); Florence Weyant (Alda); and Florence Bach (George, Ulysses). A lot of speculation and assumptions here. But perhaps you the reader can do better? 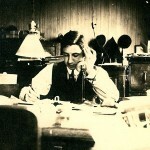 By the way, once “Bert” got to Colorado, he became engaged but chased off by the woman’s father, citing a belief that Gilbert had tuberculosis; he then married and divorced a beautiful redhead named Wray Slack; and then tried to court Marie Frank, of Lower Turkey Creek (formerly of Upper Turkey Creek). 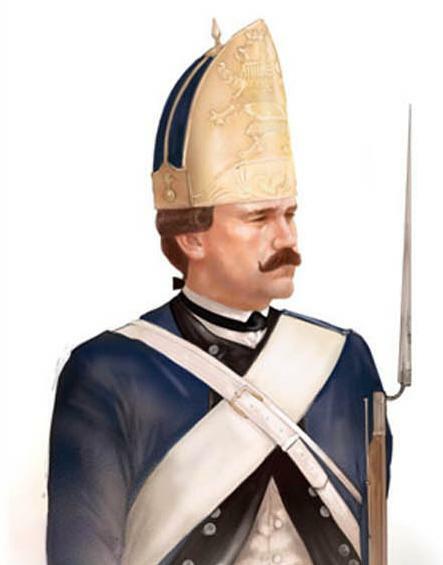 Gilbert must have had charms beyond the value of his looks (Gilbert’s image is below). At the age of 35 he married Marie’s sister, 18-year-old Georgia Frank. Excellent choice. Georgia was an amazing woman with many talents. She was a dynamic civic leader, Mayor of Pueblo, Co., and has a street there named after her. She was a commanding personality and I visited her when she was 90. She drove me to a store to buy razor blades, running several stop signs along the way. I don’t make this stuff up. This entry was posted in Uncategorized on October 10, 2014 by Tony Bentivegna. 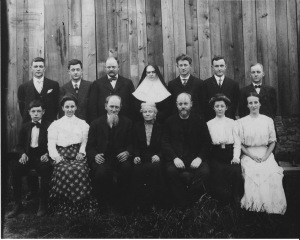 Some of the children by this couple are also baptized by Gallitzin, but Conrad (formerly associated with the First Reformed Church in Lancaster) does not appear to budge. There is an uncharacteristic fragment at page 273 of Gallitzin’s journal where he starts recording the baptism of a “Bernardus” without surname in 1823; researchers believe Conrad’s full name was Bernhart Mariannis Conrad Luther. But Gallitzin’s failure to complete this record with a surname, sponsors and his signature really makes the connection highly speculative. Conrad dies sometime before June 6, 1824, when Elizabeth is first identified as a widowed baptism sponsor. He then understandably does not get buried at the consecrated Catholic cemetery in Loretto, which leaves the reasonable inference that he is buried on the farm. This is certainly the consensus of local history. 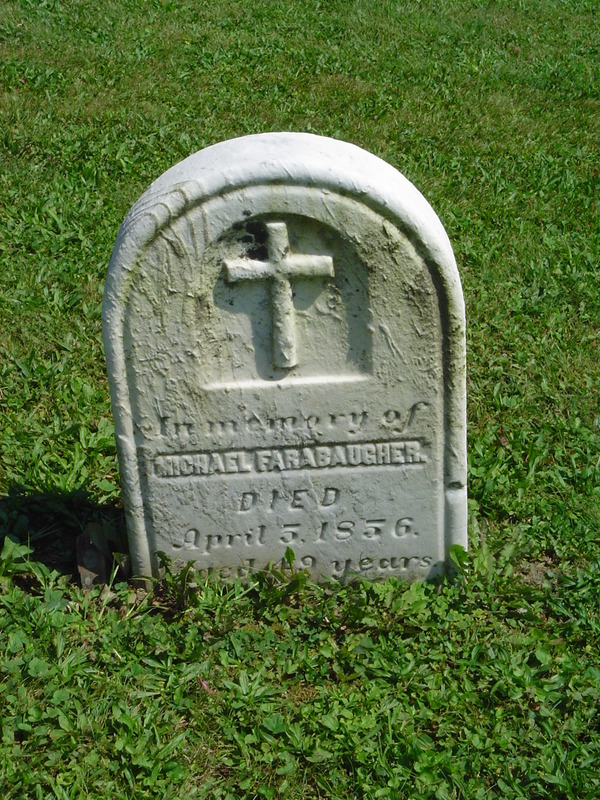 But the grave markings have never been found on the Will Farabaugh farm. Has anyone looked for them? Have farm ploughs uncovered anything? Is Conrad at peace? Would a metal detector uncover a really cool Hessian helmet? This entry was posted in Uncategorized on October 8, 2014 by Tony Bentivegna. With Halloween approaching, I thought I’d come up with ten spooky unsolved Farabaugh mysteries. Solve them if you dare! I’ll post more in the upcoming weeks. . .
No. 10. Are there any Wirtners? They thrived 100 years ago, with huge farming families in Carrolltown and Patton. 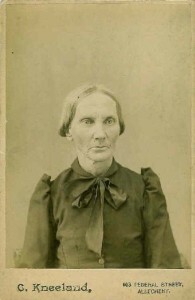 Catherine (Farabaugh) Wirtner was one of the matriarchs, with 15 children. But the men from the next generation did not procreate much, entered the priesthood or died under tragic circumstances. Cyril was a butcher who died suddenly of “apoplexy.” Vincent died in a railroad accident. T.H. was shot dead when he refused to give his car keys to a home intruder. Their father John (a tinsmith who made the original cross on the spire of St. Benedict’s Church in Carrolltown) evidently lost his sight in a fence wire accident. Uncle John died when thrown from a horse near Loretto in 1848. 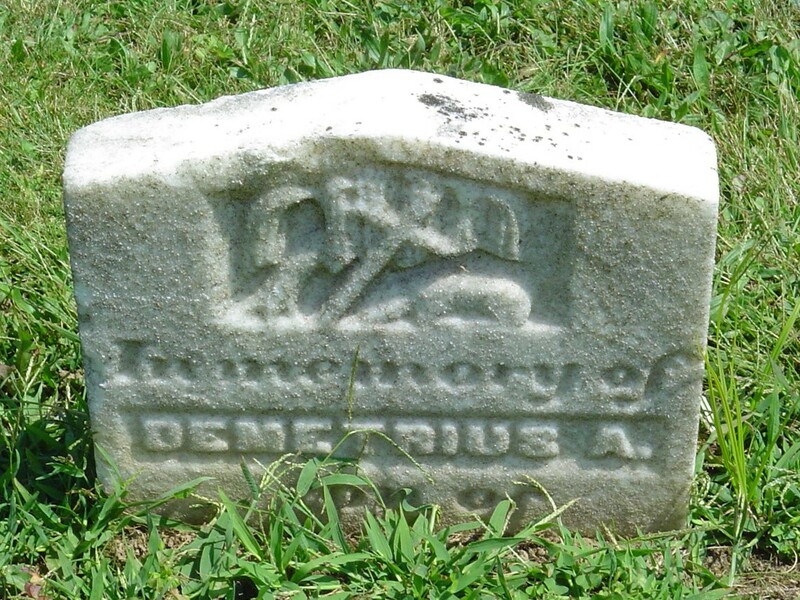 Another uncle, Benjamin, also had a large family but 3 children died in the span of five days in 1865. I think another one died from some incident involving lightning, a barn and a horse, but I can’t seem to find the exact anecdote. The Wirtners certainly had their fair share of tragedy. Is there one descendant left to carry the name today? Let me know if you find one! This entry was posted in Uncategorized on October 7, 2014 by Tony Bentivegna. My Uncle Bede was watching a Jeopardy re-run from 2012, and up pops a Farabaugh. I didn’t know Jeopardy had re-runs. I assumed 5 nights a week were enough. 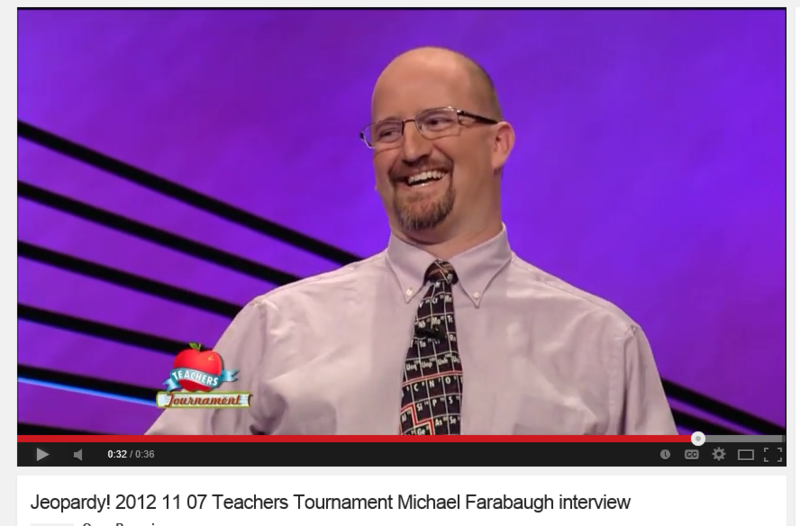 So, this is Michael Farabaugh, a Chemistry teacher, and Bede wants to know how we’re related. There are 27 Michael Farabaughs in the database, but no problemo. 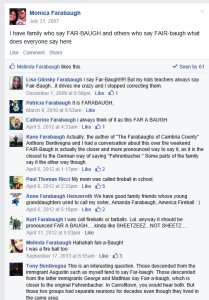 This turns out to be Michael Anthony Farabaugh, the grandson of my great-uncle Fred Farabaugh. This means he is but one of a gazillion second cousins whom I’ll probably never meet. Anyway, Michael here is a pretty entertaining fellow, and he did well. In this teacher’s tournament, he went all the way and ended up as the overall runner-up, winning $50,000. In the video below, Alex gets involved. He gets Michael to sing his version of the Jeopardy song but at the very beginning he pronounces his name as FAIR-a-baugh! I was shocked and appalled. Augustine is rolling over in his Carrolltown grave. But then I remembered that Alex is Canadian, and Canadian opinions don’t really count for much, do they? This entry was posted in Uncategorized on September 11, 2014 by Tony Bentivegna. Today, I was astonished to find this image of the immigrant Viktoria Fehrenbacher (1832-1905), aka Victoria (Farabaugh) Bechel). The picture is just what I imagined: stern, blue-eyed, intimidating, maybe even defiant. Victoria was the kid sister who arrived from Kappel in 1853 with her nephews Charles and Bernard Farabaugh. With the help of Fr. Peter Lemke, Carrolltown’s founder, she lived and worked at the Blair House in Ebensburg, a “famous hostelry,” according to the obituary of its eminent proprietor, John A. Blair. Here, poor 23-year-old Victoria became pregnant by a resident rake, 48-year old Dennis Brawley. We know of their child Matilda from the birth record at St. Benedict’s in Carrolltown (in Latin, the record impassively says Matilda “ist illegitima filia”) and a privately published account of John Blair, by descendant Marilyn Horan Krall. Just two weeks ago I was telling my wife about the liason while unsuccessfully looking for Dennis’ grave at Old Holy Name Cemetery in Ebensburg. Dennis did not marry the compromised mother, and by all accounts never moved from the Blair House for the rest of his life. Victoria moved on. In 1859, she married another older man, Frederick Bechel, and they raised Matilda and two of their own. They are buried together at the church in Nicktown. I often wondered about Victoria’s 19th Century plight. Why didn’t any of her brothers take her in when she arrived? Why does she not appear in any of the early Farabaugh group photos? Once she was “in trouble,” did they all just shun her? The plight of an unwed mother then and there must have been terrible. I was just casually surfing the internet for obituaries, noticed that researcher James Thomas Rosenbaum had a collection and then was amazed to happen upon this. This photo collection does not kick up if you google Victoria. Finding this was just serendipity beyond belief. The photo belongs to descendent Nancy (Kirsch) Miller. I think Nancy was in the color guard while I was in band at Bishop Carroll High in Ebensburg, so I emailed to learn more about this picture. Where has it been all of these years and are we 100% sure it is her? I hope to hear from Nancy soon. This entry was posted in Uncategorized on August 22, 2014 by Tony Bentivegna. There are two ways to get to Carrolltown from Loretto. First is the “Dutch Road,” nicely paved, with the stone castle reservoir built by Charlie Schwab as you leave town, open vistas of rolling farmland, and a roly-poly romp towards the end. Second is the more intriguing “Brick Road.” Much of it plunged you right into the dark woods, red brick by red brick, with many treacherous potholes, even after it was slowly paved over in the late 1960s. There was a very spooky mansion on the hill overlooking Bradley Junction – sometimes occupied and sometimes not. We were never quite sure who or what was in there. My Dad used both roads equally, but it is the Brick Road that takes you to the sites of the four original Farabaugh farms. And here they are (click image to enlarge). . . The first home was the 1840 settlement of Augustine and Mary Fehrenbacher/Farabaugh, which was the subject of my earlier post (“Finally, a Visit to the Homestead”). 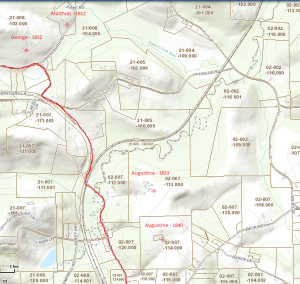 Here, I want to address the similar home built downhill when the adjacent land was purchased in 1853, bringing the homestead tract up to 100 acres total. This home was built for the family of their son Erhard (aka Erhart) and his wife Annie Eckenrode, who also married in 1853. The unmarked access road is just past Bradley Junction. 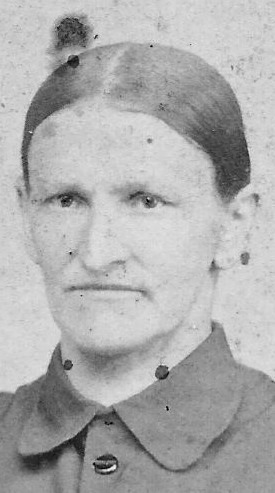 According to the 1900 Census, Annie was living at the Allegheny Township home with her widower son Henry and his 3 year old daughter Catherine. Also living there was a 14 year old “servant” Anna Adams, who was actually a granddaughter. Following Annie’s death in 1906, the parcel was overtaken by one of the younger children, Jim. 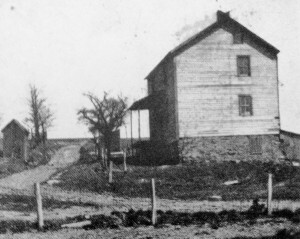 Jim greatly expanded the site, as evidenced by the 1918 photo above. This set of buildings excludes the original home, which would be up and to the right. 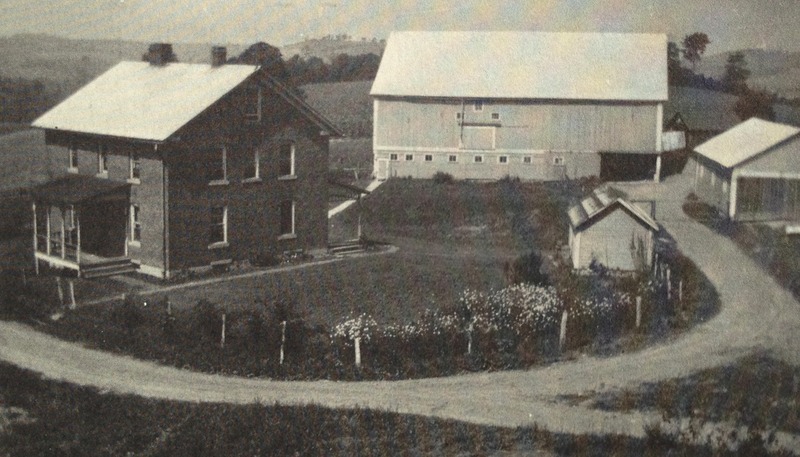 Lucy Mock, James’ granddaughter lived on this farm from her birth in 1929 to about 1950. 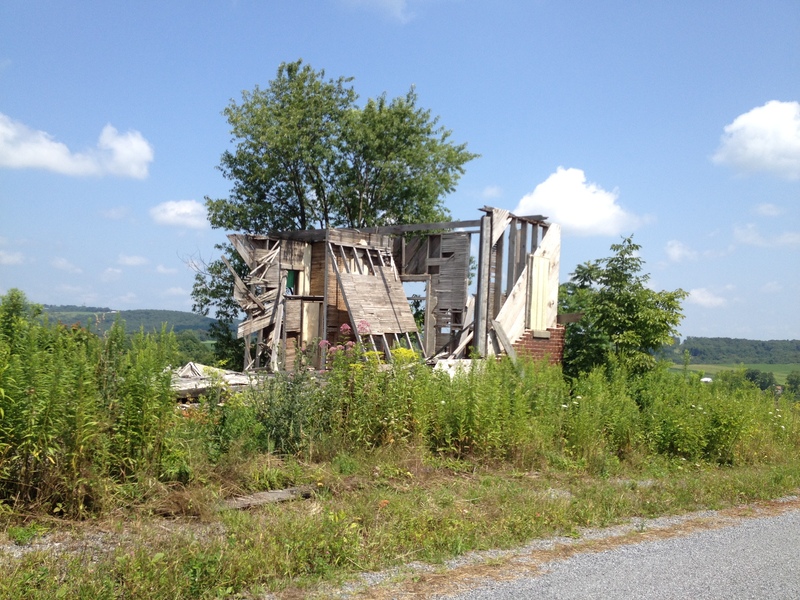 Lucy explained to me that as a child the original home was abandoned and used as a playhouse. This aerial view of the jim Farabaugh farm from about 1950 shows that the original home (marked by the red arrow) was still standing and was now surrounded by a grove of trees. 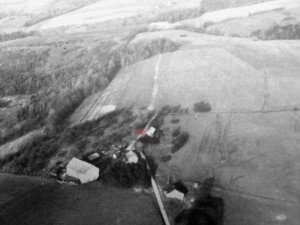 The original 1840 hilltop settlement is up the hill and to the right, out of view. 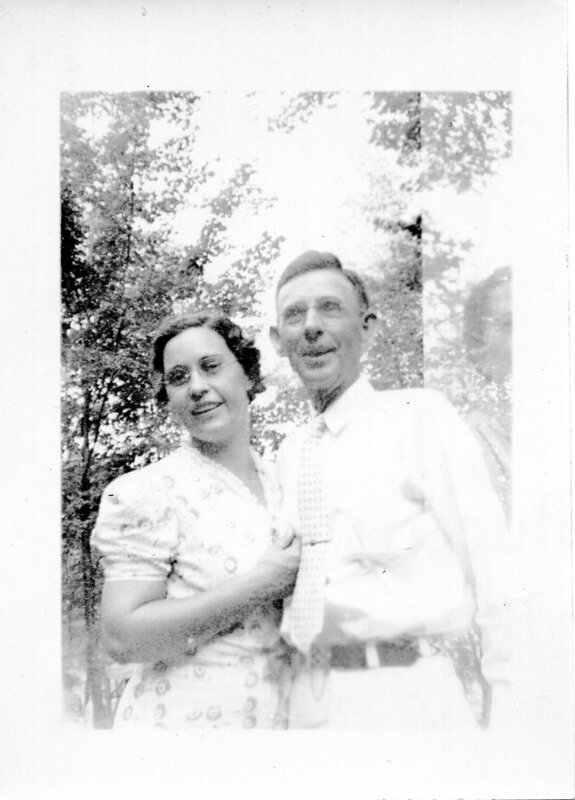 Jim died in 1958, and the farm was resumed by his daughter Minnie and her husband Ed Kirsch. 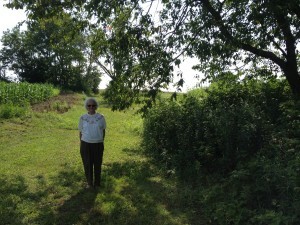 It has been known as the Kirsch Farm until very recently when it was sold to Daniel and Mary Jane Rieg. On August 4, 2014, Lucy Mock poses in the lane where the entrance to the original Erhard Farabaugh homestead once existed on the right. 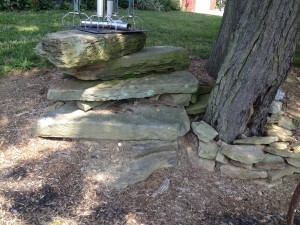 A grove of trees obscures the foundation. In her youth, she used to regularly walk up the road behind her and over to the right past the original Augustine homestead and on up to the Bishop School House, the remains of which are at the top of hill along what is now Beck Road. Incidentally, this area is surrounded by at least a dozen later farms and homes that are occupied today by various Farabaugh relatives. 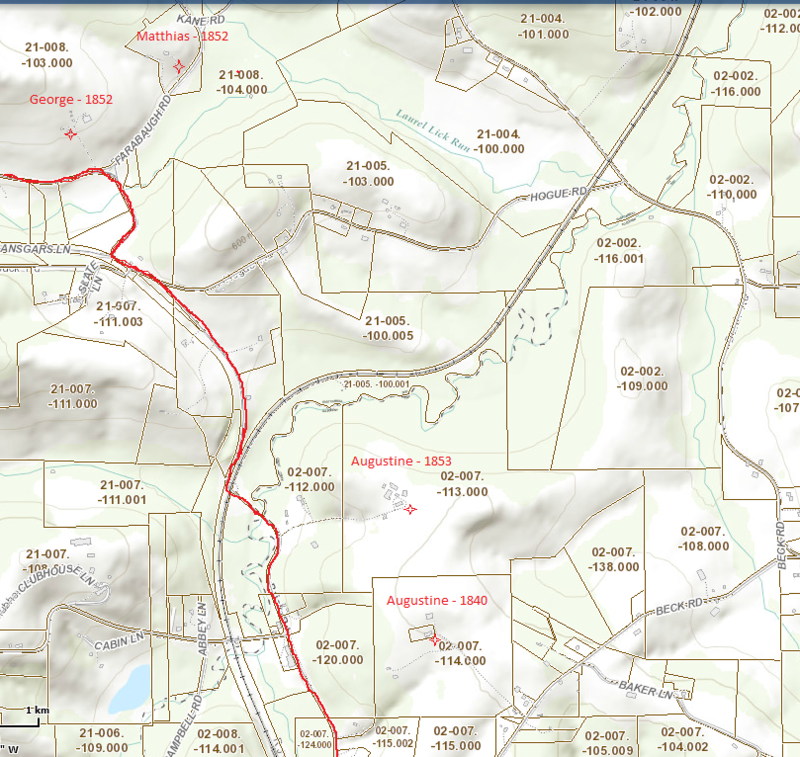 To explore these tracts, you can visit the GIS Cambria County site to learn more. They reflect the expansion by the subsequent generations, following the original four settlements. This entry was posted in Uncategorized on August 14, 2014 by Tony Bentivegna. Standing on the spot of an ancestral home is somehow humbling. It hopes to explain who you are and how you got here. Although I wrote a book on the Farabaughs and complied a detailed history of the family, capturing images of the homestead and walking the farmland somehow eluded me until August 4, 2014. With the help of perhaps the only relative with a memory of living on the tract, Lucy Mock, and the current owner Ed O’Brien, here is what I learned. Augustin and Mary Fehrenbacher came to Cambria County in 1833, and they settled at their home in Allegheny Township in the year 1840. We are able to pinpoint the year because the property deed is dated January 7, 1840. Although they were living on another parcel they owned in Susquehanna Township where their son Anthony was born in the Spring, they relocated to their newly-acquired parcel in Allegheny Township as reflected in the Census taken later that year. 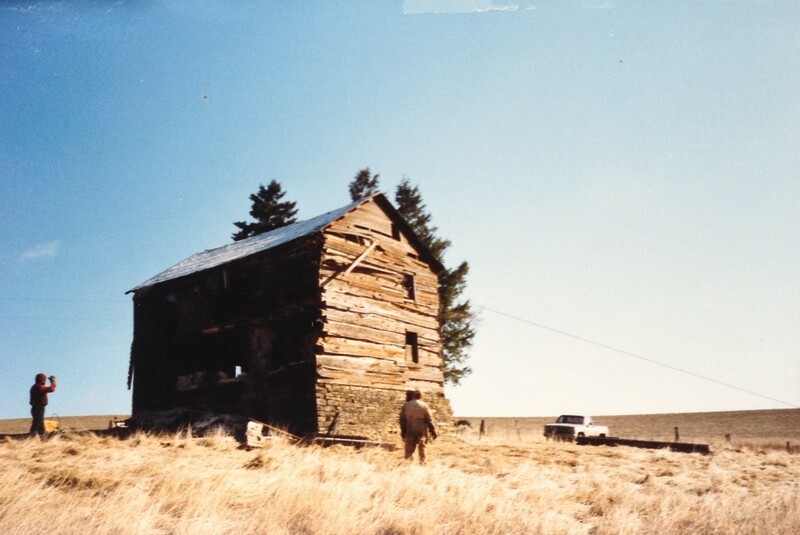 Here are images from 1988 of that stark home, which was situated within the cleared and sloping landscape of the farm until it was demolished in the following year. . . 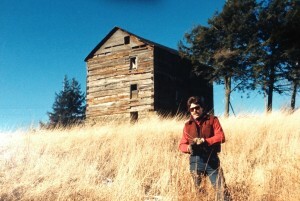 This is Ed O’Brien, current owner of the original homestead. 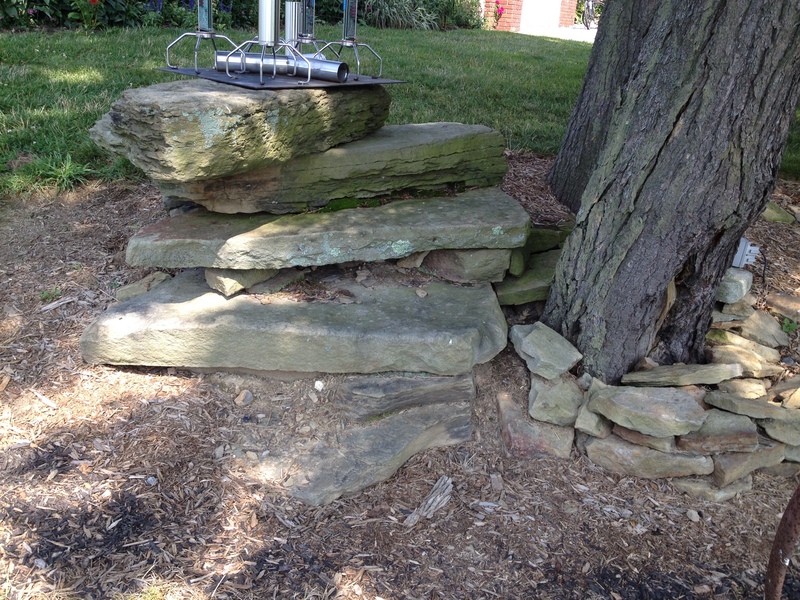 Ed used much of the stone and wood beams to build two beautiful homes for his family. This original home was occupied by Augustin and Mary until they moved to Carrolltown around 1858. Their son Edward married that year and raised a large family here – a family that was greatly affected by diptheria and tuberculosis – remaining until 1888. The home was then acquired by Edward’s nephew James before becoming the home and farm of another nephew, Edward Giles Farabaugh, for several decades. The tract fell out of family ownership when it was sold to “Easy Ed” Smithbower in the mid to late 20th Century, transferred to George Smithbower (whereupon it was no longer occupied but used to house pigs), and finally purchased by Ed O’Brien in 1988. Preparing the home for demolition, this cross-section shows the foundation and cellar that demonstrate the stone masonry skill of Augustin. These stones were individually chiselled to fit without mortar. 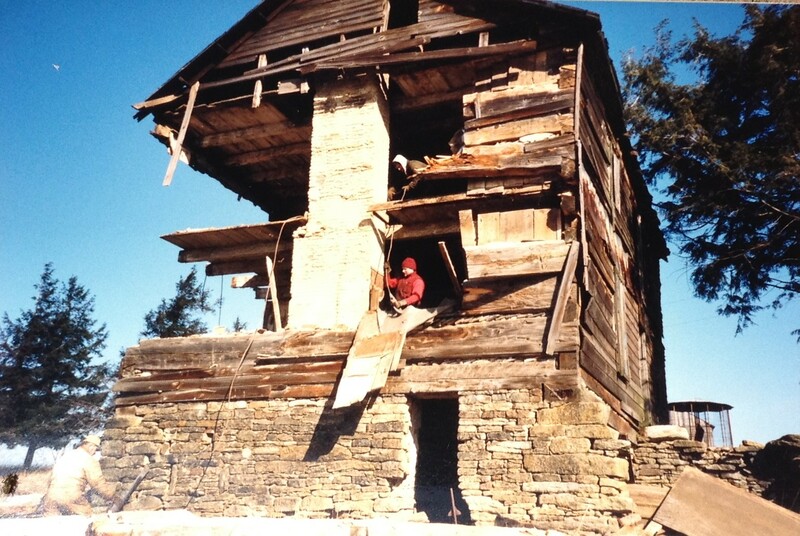 Ed O’Brien explained to me that the first story chimney with flue was made of clay with horse-hair glue, shown here, with Mr. Driskel on the first floor. An interior staircase led to the second floor that likely had three bedrooms. 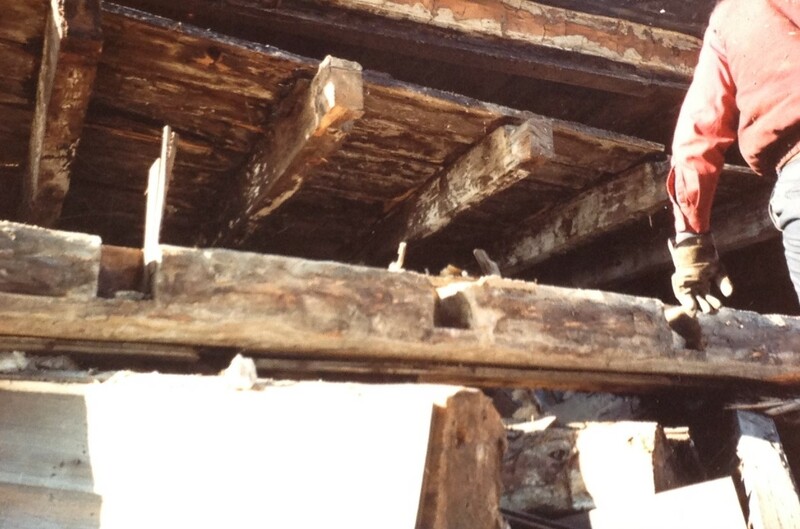 And then there was an attic. What we don’t know is how the lumber was prepared. The area had various saw (or “planing”) mills but which ones were in operation in 1840 are unknown to me. 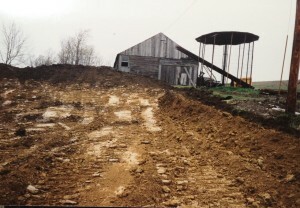 At right is the entrance with a white grist mill stone; further in the distance is the barn, which dates later than the original home. Large floor joists that account for the home’s durability and are were reused for Ed’s current residences. 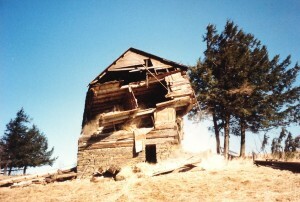 This image captures the moment of demolition in 1989. 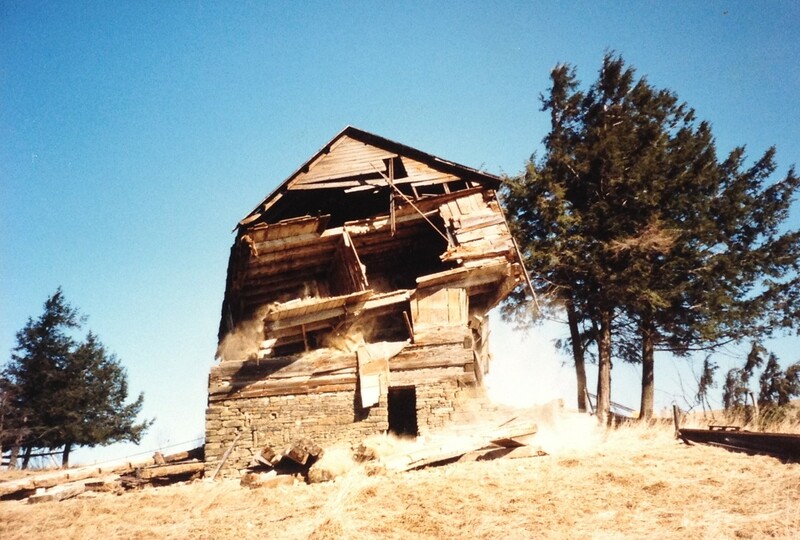 With the home cleared away, the barn became the next casualty . . . I asked Ed if he found any original artifacts during the demolition. 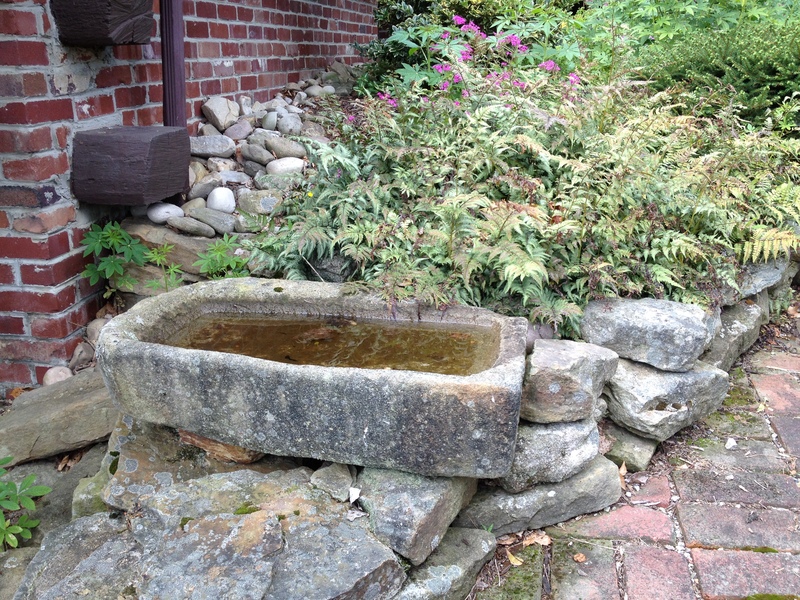 He told me the original stone sink was in place on the first floor, which was gravity fed from above the house where he found an approximately 60 foot water well toward the area where the barn stood (Ed dug a much deeper well next to it). Ed located a sistern near the barn. The home never had running water and likely had an outhouse nearby. 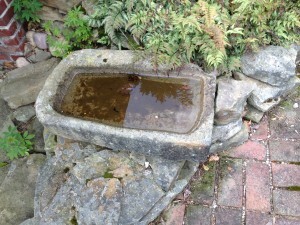 Ed removed the stone sink and the stone drainage, and placed it as a birdbath next to his smaller home on the property. Ed and I strongly believe these must have been chiselled by Augustin, because they were integral to the original home. 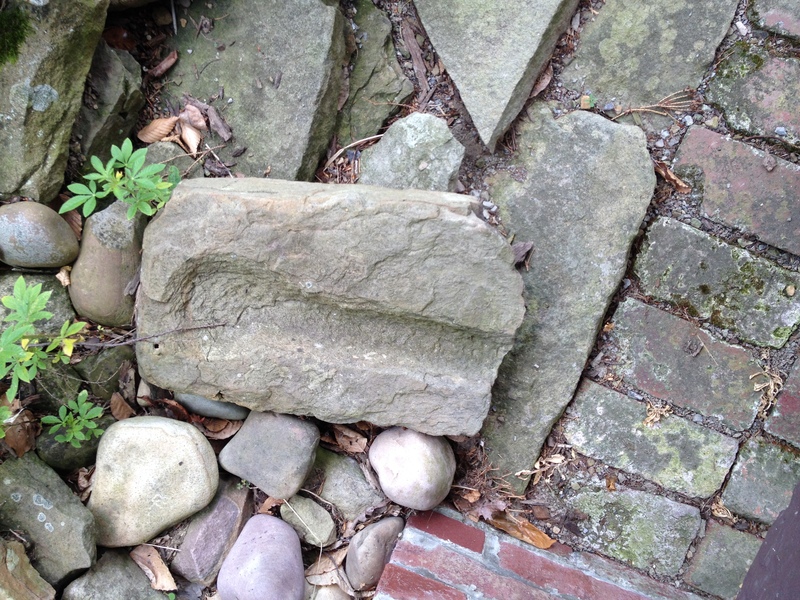 Below are the original stone steps leading into the homestead, which were not moved. I should have moved the metal pieces and had Ed or Lucy taken my picture. The original home is now a grassy front lawn behind which Ed built the current home. I really should have taken more pictures of the current parcel. 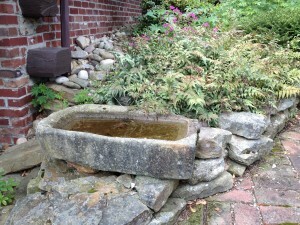 Ed has extensive gardens and has a keen sense of design that utilized much of the original character of the settlement. I first met him in 1990 when the homes were newly completed and was aware that he took “before and after” pictures. 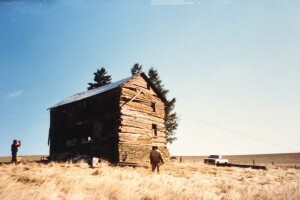 It amazes me that no photos of this place surfaced during the years I lived in Loretto, and that no relative told me it was still there. I will soon do another post that explains the second, nearly identical, homestead down the hill from this and the associated memories of Lucy Mock. This entry was posted in Uncategorized on August 13, 2014 by Tony Bentivegna. My apologies if a few of you received this twice. Stumbled upon and added the angelic 1915 wedding photo of 19-year-old Catherine (Hitch) Krise that for now kicks off the slideshow. We’re lucky to have so many great photos. Certainly my gr-gr-grandfather Joe Farabaugh (1854-1947) had a lot to do with this. He probably took this one. The website subscription list is only about 25 whereas the Facebook list is about 75. Not sure what to do about this as I’d prefer to make this the main meeting place for everybody. I could import everyone involuntarily but that seems rude. Let’s see how this blog pans out before I begin tinkering with things. Any questions? This entry was posted in Uncategorized on July 30, 2014 by Tony Bentivegna. 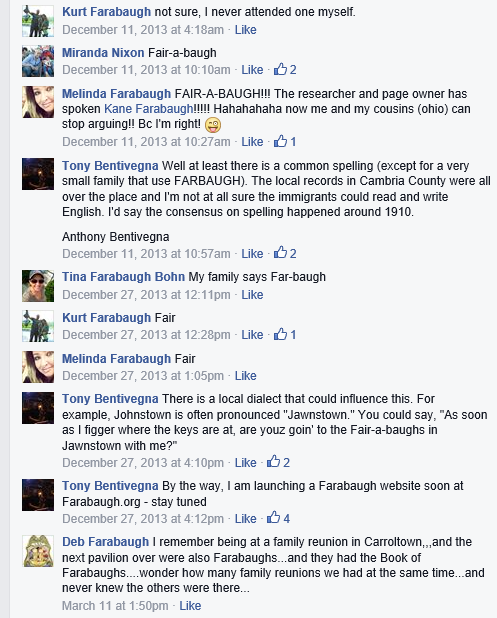 This is the Farabaugh Forum. Post a family update. Submit a photo. Add a story. Let us know of your reunion or event. Gripe about your mother-in-law. Name the official Farabaugh pig. This entry was posted in Uncategorized on July 4, 2014 by Tony Bentivegna. 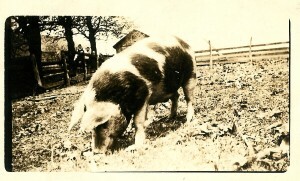 This fine specimen from nearly a hundred years ago was raised by the Peter & Lizzie Farabaugh family. This pig needs a name. Any suggestions? This entry was posted in Uncategorized on July 3, 2014 by Tony Bentivegna. 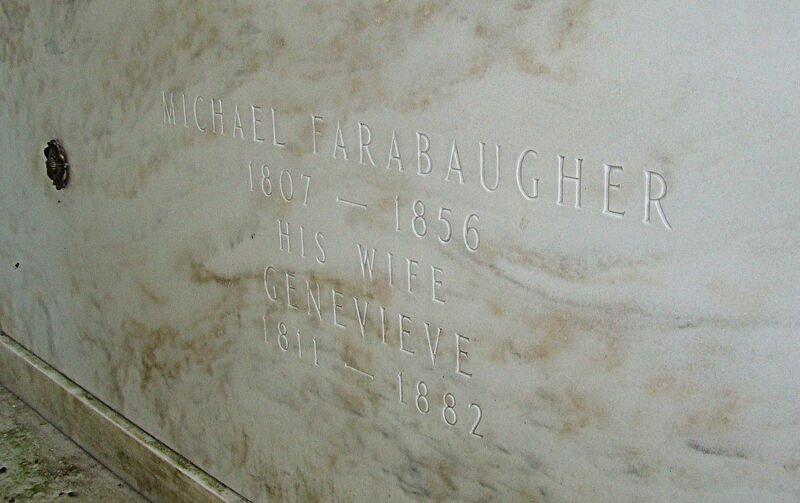 Welcome to my website, dedicated to the genealogy of the Farabaugh families. The name is unique to Cambria County, Pa. 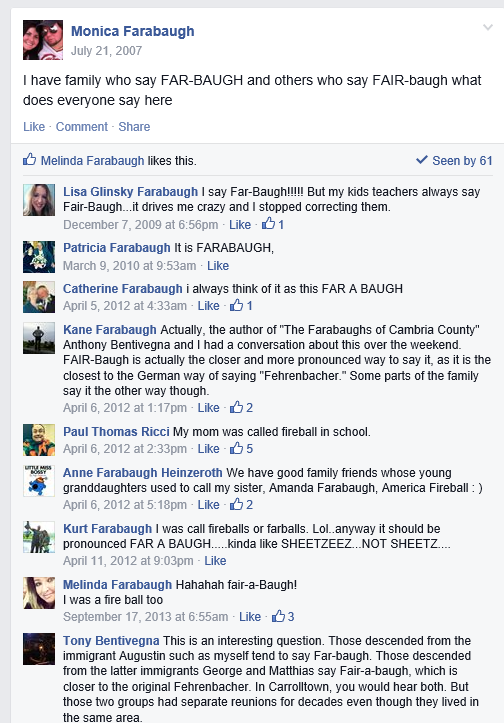 It is a cognate of the Fehrenbacher surname, which originates from the Baden-Würtemberg province of Germany. I began researching my cousins in 1972, and published a book in 1990. Since then, I received many corrections, additions, anecdotes and photographs. The basic family tree with index is included here, with a privacy filter. then email your photos, additions and corrections to me at novatony@verizon.net. Also, join us on Facebook. It is my hope that relatives will help fill the branches of the family tree with the newer generations, contribute interesting narratives and provide photos. If things go well, there may be a second edition to the book! Finally, subscribe to this site below if you want to receive my occasional family essay.